Onions have been widely used for a long time. It has been used for adding rich flavor to food and helped improve the health of millions of people because of its medicinal properties. This vegetable has a lot of uses and one of it is through the process of drying which is demanded in cooking especially meat. There are many drying methods at home and we will learn all four of them and their processes step by step. All these methods of drying onions are easy to follow and can be used in your horse’s comfort. This allows you to try and see what method works for you. This process of drying onions will require some tools that can easily be found in your kitchen or around the house. You will need a knife, an oven, a baking tray, a jar, tarp, mesh bags, baking sheet, and an electric dehydrator. The first method is drying onions on the ground. To start, trim the roots and leaves of the onion about an inch. You don’t need to cut the stem. Just make sure you avoid damaging the bulb. Next, you must prepare the flooring. If you don’t have paved flooring, you may use a tarp and lay it on the floor. When ready, you may now spread the onions evenly on the tarp making sure that each onion has enough room for air but not directly exposed to sunlight because it might result in a bitter taste. Observe the skin of the onions. It will dry off and will tighten up to the stem. Let it dry for 2 weeks more until you see the neck tightens and almost closed. You can store the dried onions in a cool, dry and dark place after approximately two weeks. This method requires you with only some simple tools. One is the use of mesh bags to prevent moisture from entering the onion. The next method is braiding and hanging. The name gives you a glimpse already on what to do with the onions. You would need a long stem of onions for this method so that it will be easy to intertwine them later. To start off, clean the onion and trim off the roots. Don’t wash it because bacteria may grow into them. Remember to leave 6 inches of the stem so that you can braid them properly. You must start at the bottom. Just like how you will braid your hair, start with three stems and intertwine them together. One at a time, add three onions while tracing the stems of the previous one. Next, add more stems until you reach a foot of twisted onion. When you reach the end form a knot. They are will become hard and strong as they dry. When you are done braiding the onions, you can hang them on a warm, roofed open space. The advisable place to hang the braided onions would be outside your kitchen. The third method in drying onions is in your oven. Start by pre-heating the oven to 140 degrees Fahrenheit or 60 degrees Celsius. This will evaporate the remaining moisture without roasting your onions. You will now need your baking tray and baking sheets. Line your baking tray with the sheets. Make sure to cut and peel the tops and bottoms of the onion. Slice them in whatever sizes you want. If you decide to use them as toppings, you may cut them into strips. This will give an attractive look. To let them dry faster, mince the onions. When ready, lay them on your baking tray and bring them into the oven. This method might look tricky because you don’t want to cook the onions, so you need to leave the oven door slightly opened. Check the onions from time to time and flip them about every 30 minutes to dry them evenly. If they are leathery to the touch, then they are good to go. Cool them at room temperature and keep them in a jar. Make sure that the moisture does not enter the jar. Another storage option is crumbling the dried onions. It will be brittle enough to crumble it to form onion flakes. You may use your hands to crumble them. You may also use a rolling pin. In a plastic bag, place the dried onions and roll it with a rolling pin. With this, you can produce onion powder. The last method you can use to dry onions is using an electric food dehydrator. Begin by cutting and peeling the top and bottom of the onion and slice it accordingly. 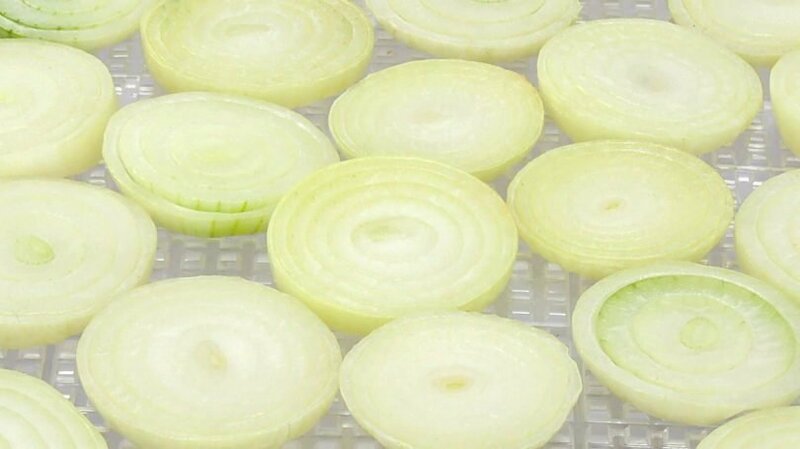 Set the temperature of the dehydrator at 140 degrees Fahrenheit or 60 degrees Celsius and place the onions inside. Keep the dehydrator running for 12 hours. Make sure to check every after 30 minutes and see if the onions reached your desired dryness. Now it’s time to cool it down at room temperature before storing the dried onions in a jar. Keep an eye for moisture. If you notice any moisture in your jar during the first weeks of storage, remove the onions and let them dry further. Dry the jar before you place the onions inside. It is important to watch for moisture. The presence of moisture can spoil the onions more quickly. The drier it is the longer you can preserve it. These are all four methods you can use to dry onions at home. You can now produce dried onions with simple and easy steps. They can last up to a year if stored properly. If you consider rehydrating them, you may soak them in water. Dried onions can also be pulverized to make onion powder in a food processor. You can use dried onions in your recipes in many ways. Always remember to store them in a dry, cool and airy place. You may also consider the time for the bulb to dry, which is 10 to 14 days or longer. Using the methods given, you can try each one and see which method is easy to work within your circumstance.